Catleaps Gymnastics has a strong track record for training and mentoring people into gymnastics coaching. Bringing together keen and willing volunteers girls and boys from 14 years plus, and male and female adults, from an education, club and community setting to develop their own skills whilst volunteering within the world of gymnastics. Skills ranging from administration and management, coaching and judging through to event organising, health and safety and marketing. Catleaps will pay for your British Gymnastics membership, and for your Disclosure & Barring (DBS) check (required for 16 years and over). We will then train and mentor you through your first coaching qualification, which depending on your age will be the Award Scheme Coaching Qualification, or straight onto the UKCC Level 1 course. Catleaps cover the costs of the coaching qualification, training and mentoring and when you are qualified, it will become a paid position. We estimate that it would take a maximum of 6 months until you are qualified, but we anticipate that it would be a lot quicker. We guide the leaders through the Proficiency Coaching Award on to UKCC Coaching and Judging qualifications, including generic sports training. They are also provided with the opportunity to volunteer at national, regional and local events and within a club setting. Key staff members at the club are trained through the British Gymnastics mentoring programme to ensure that our volunteers receive a high quality experience. 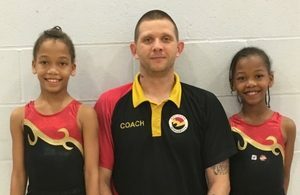 50% of the founding members of the East London Gymnastics Academy, which is the East London branch of the British Gymnastics Leadership Academy are from Catleaps. 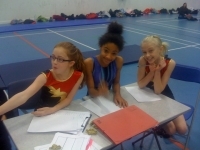 The young leaders from the academy have volunteered at both Regional and National events and organised the London Regional Acro competition and Key Step Competition. Due to expansion we are looking for new recruits to work with us to train to become qualified, paid coaches at our classes at The Coopers’ Company & Coborn School, Upminster and the Robert Clack Leisure Centre, Dagenham. Gymnastics experience is beneficial but not essential. Suitable for Adults and Young People (minimum age is 14 years). The ideal candidates will be confident motivators of young people with an interest in Sport; enthusiastic and willing to learn. If you are interested in this opportunity, please complete our registration form and we’ll be in touch with you. Charlotte suffered a knee injury through netball in 2007 which prevented her from continuing to participate in Sport. She started on our Young Leaders programme, and became quite an expert in gymnastics; quickly gaining her coaching qualification, despite having no previous experience of the sport. Due to her exceptional efforts, Charlotte was awarded the ProActive Young Volunteer Award. 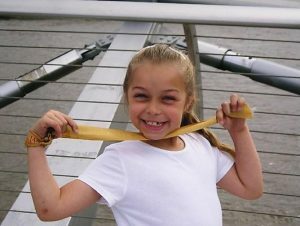 Chloe started at Catleaps in 2007 and proved to be a very talented gymnast, competing in regional and national competitions. 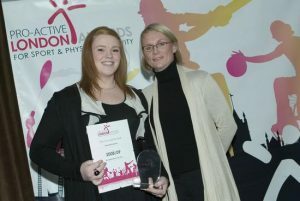 She has volunteered at competitions and festivals and is a valued member of the London Gymnastics event team. Chloe has passed her Proficiency Coaching Award, and moved on to her UKCC Level 1 Coaching Course once she reached the required age. Chloe passed the UKCC Level 1 course and is such a valuable member of the team. As a parent Mark has been involved with Catleaps Gymnastics from the day the club started. Three of his four boys (Jack, Billy and Joe) have attended the club, with his fourth son Alfie being an invaluable volunteer at our events. As a football coach Mark already had some of the skills needed but has no experience of coaching gymnastics. After volunteering within the club we supported Mark to achieve his Level One qualification. At his assessment the tutors were impressed with Mark’s ability so we then put him forward to take his UKCC Level 2 qualification, which he passed with flying colours. Mark’s now a well respected and valuable member of the Catleaps team and continues to develop his knowledge as a coach through courses and research. Being involved in gymnastics over the years has helped me understand commitment, hard work and persistence. Gymnastics can be a major part of all dance. We throw Perri around and do tumbles in our dance routines so timing is crucial. The leadership academy for me was an informal group of teenagers coming together to make a change, very similar to the beginnings of Diversity. Dream, Believe, Achieve!